Should you continue your yoga practice when you have a cold? There is nothing worse than realizing that you’re coming down with a cold or the flu. Throwing a wrench in your routine, getting sick disrupts you physically, at work, and during exercise. Well aware of the ‘neck-check,’ proceeding exercise with caution while sick is key. As a long-time participant of the yoga practice, I wondered if that sort of exercise would actually benefit your body when you have a cold, specifically hot yoga. Yoga, in general, provides a number of different benefits to your body, both mentally and physically. However, hot yoga (my absolute favorite) has the added benefit of heat, which helps in loosening tight muscles and joints, relaxing your mind, allowing you to breath deeper and fuller, and increasing circulation throughout the entire body. 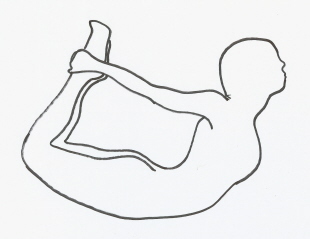 For example, poses like Cobra and Bow, both upper back bends, open up the chest and the lungs. In turn, this openness boosts the Thymus gland, located in the center of the chest and responsible for providing a boost to T-cells in the immune system. Despite the countless benefits of hot yoga (and cold yoga), it is still important to note that in most cases of illness the best thing for your body is to rest. Rest is key, especially in the first 1 to 3 days of a cold or the flu when you are still considered infectious or contagious. Avoiding those first few days prevents you from spreading germs to your yoga classmates and instructors. Once the infectious stage has passed and you are deemed well enough to return to yoga class, there are a few things of note. If you have a cold or residual congestion, most yoga routines can be modified to fit your needs. In these cases, a standing routine would be most beneficial so as to avoid inversion poses like Wheel or Head/Hand/Shoulder Stands. Inversion poses can cause more difficulty in breathing for someone who is experiencing congestion. The ultimate rest position, Savasana (and every yogi’s favorite part of practice), occurs at the end of each class to center your breathing and bring your body back in focus. When you have a cold, Savasana is helpful with a towel roll placed from the lower spine to head so as to open up your breathing. The best thing about yoga is that it is an individual practice that can be modified as much or as little as needed depending on your ability for that particular day. When we’re sick, our immune system produces antibodies that are made up of energy-rich proteins and amino acids. The level at which you are sick directly correlates and determines the level of energy needed to fuel the immune system. Exercise can be counterproductive in the worst stages of a sickness as energy travels to the muscles for movement rather than the immune system for fighting off germs. In other words, the most important thing in practicing yoga, or any form of exercise, while you’re sick is to wait until you are past the worst stages (or first few days) and regaining some of your energy. What are some of your favorite restorative yoga poses? Thank you for the info . Have a day off from work today and was looking forward to my hot yoga class which I love !! !, but i have a very bad cold. Went to sleep with a little cold and woke up with bad one ! Was trying to rationalize a 4 30 class , but after reading your comments , I think you are right and I will wait till Saturday ! I picked up a virus with a cough & fatigue laying me low a few days. One day I couldn’t do much, let alone a home practice! The next day, I decided to just try & do what I could and made it half my usual time before I got really tired. I also skipped my treadmill walks but today I’m almost back to usual. If you are sick it would be best not to go to hot yoga practice as it’s the best way to spread your germs . It’s very irresponsible & selfish .